Upgraded Homes Feature Plank Flooring, Stainless Steel Appliances & New Backsplashes! 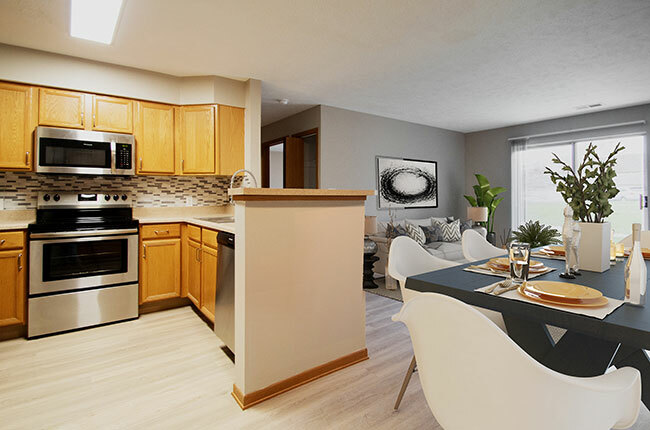 Northridge Apartments in Gretna, Nebraska offers spacious one and two-bedroom apartment homes in a peaceful environment that residents are sure to enjoy. Our community features fully-equipped kitchens, private patios or balconies, as well as a washer and dryer in every apartment. Enjoy time outdoors by making a splash in our sparkling swimming pool, or socialize with your neighbors in our community clubhouse. We take pride in our top-notch customer service. Call to schedule a tour today! At Northridge Apartments, we also boast a convenient location near Highway 6 and Interstate 80. When you live in our community, you will have access to a variety of entertainment hotspots. Northridge Apartments is located in the Gretna School District and families will adore a quick drive to Nebraska Crossing Outlets & Vala's Pumpkin Patch in their free time. Chalco Hills Recreation Area is also a short drive away and the perfect place to hike, fish, or boat. Map of Gretna, NE which includes a marker with additional information about Northridge Apartments. The address is 20222 Glenmore Drive Gretna, NE 68028.